Ban Gioc Waterfall is on the border with China. It is over 90 km from Cao Bang. And best time to visit Ban Gioc Waterfall is from May to September, when the falls are most impressive. Arrive at Ban Gioc, you will marvel at its spectacular beauty, which is worth to be the Vietnam’s most beautiful waterfall. Ban Gioc Waterfall has 3 layers and water from the peak create spectacular scenery. The atmosphere at Ban Gioc Waterfal lis very relaxed. 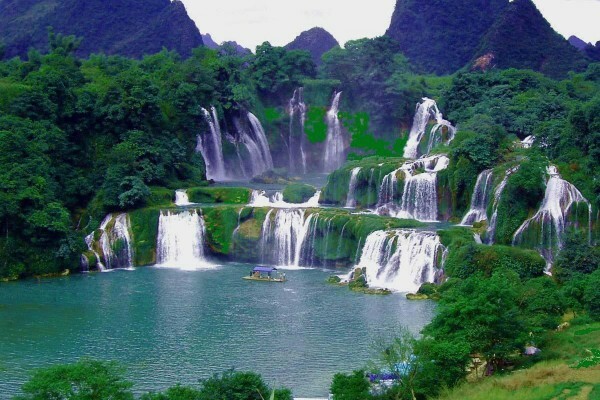 Ban Gioc Waterfall is far from the center of Cao Bang Province around 90km by bus, this is not only one of the most beautiful and impressive waterfall in the northern Vietnam but also it is the most beautiful and largest natural waterfall in Asia. Ban Gioc Waterfall is considered as the second largest water in the world that is located between two countries Vietnam and China, the waterfall is divided two parts is the main and assistant part. Now a day, all of the assistant part is belonged to Vietnam, and it is located at Dam Thuy Community, Trung Khanh District, Cao Bang Province. The main part is divided two parts of Vietnam and China. Ban Gioc Waterfall has three layers, each layer has its own beauty and difference. When should visit Ban Gioc Waterfall? The weather in Ban Gioc Waterfall is divided by two seasons is the wet and dry season, the wet season is started from June to September, this is the best time to visit Ban Gioc Waterfall because you will have a chance to see the waterfalls flow very strong and mighty. The dry season is started from October to May of the next year, this is the time for the peaceful and very pure waterfalls, under these waterfalls is the rice fields, all these make a very wonderful scenery. So, you should not miss to explore this sight if you are an adventure traveler. Each season has its own beauty if you travel this famous site is from May to September every year, it is enough hot for you to swim as well as there is not much rain, but if you visit this sight from June to September, you will have a chance to see the waterfalls flow very high and strong current. But the best time for you to visit Ban Gioc Waterfall is August because the waterfalls are the most mighty at this time, from the high place of the waterfalls even you can see the rainbow. Specially, this time the weather is very cool and comfortable, you can mix with the different activities such as climbing up mountains, exploring caves, swimming….Arrival to Ban Gioc waterfall, you will have the most wonderful experience about one of the most mighty waterfalls in the world. Beside Ban Gioc waterfall is the main sight for you to visit in Cao Bang, you also should not miss to explore another places at here such as Lenin spring, Pac Bo Cave, Cac Mac Mountain, Thang Hen Lake, Kim Dong heroic relic complex…Ban Gioc Waterfall is the pride of Cao Bang people, the local people live around Ban Gioc Waterfall is very honest, almost of them are the ethnic people. Arrival here, beside the food you should bring by yourself is you also should try the traditional food of the locals in the ethnic villages at here, it is very specially and worthwhile for you to try such as chesnut, Xoi Tram, Banh Trung Kien, Banh Quan…..
How go to Ban Gioc Waterfall? You also catch bus from Hanoi to Cao Bang, it takes around 300km from Hanoi to Cao Bang province, then catch a local bus from the center of Cao Bang province to Trung Khanh, from Trung Khanh you catch a motorbike (xe om) around 20km to Ban Gioc Waterfall, or you are possible to ride a motorbike from Hanoi to Ban Gioc Waterfall by yourself if you are a real adventurer. This is one of the most beautiful and famous waterfall in Vietnam, if you are the tourist who prefer to explore about the mighty natural landscape and famous waterfalls in Vietnam is this is an very ideal destination for you to explore.